This recipe was originally posted on April 17, 2013. Updated with new photos and content on April 26, 2017. Cashew Chicken Meatballs – Seasoned and nutty chicken meatballs served with a side of sweet and sour sauce. Here, in this little corner of mine, you and I always discuss yummy things. Today, just like any other day, we’re going to discusssss… that’s right… yummy things. 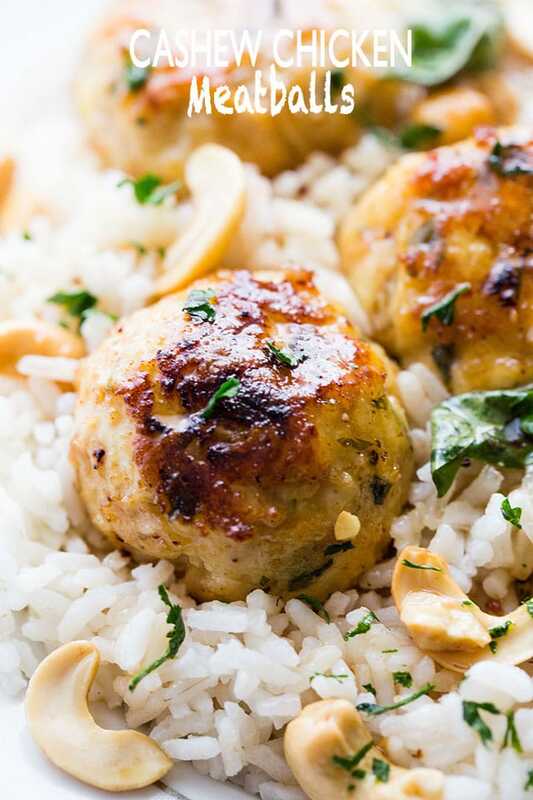 Things like Cashew Chicken Meatballs. I was typing a post – the one about my Salted Chocolate Caramel Popcorn – at the same time, I was also munching on cashews. I mean, I can’t just type and not snack on something. That has never happened. And, as I was chomping away, I was reminded of cashew chicken. One thing lead to another and, well, as you can see, I made us these outrageous cashew chicken meatballs with homemade Sweet & Sour Sauce. Which is also just as outrageously awesome as the meatballs. SO GOOD! Finger lickin’ good. Like, smack your lips good. You get it. Cashew Chicken Meatballs - Seasoned and nutty chicken meatballs served with a side of sweet and sour sauce. Place the flour in a shallow dish and set aside. 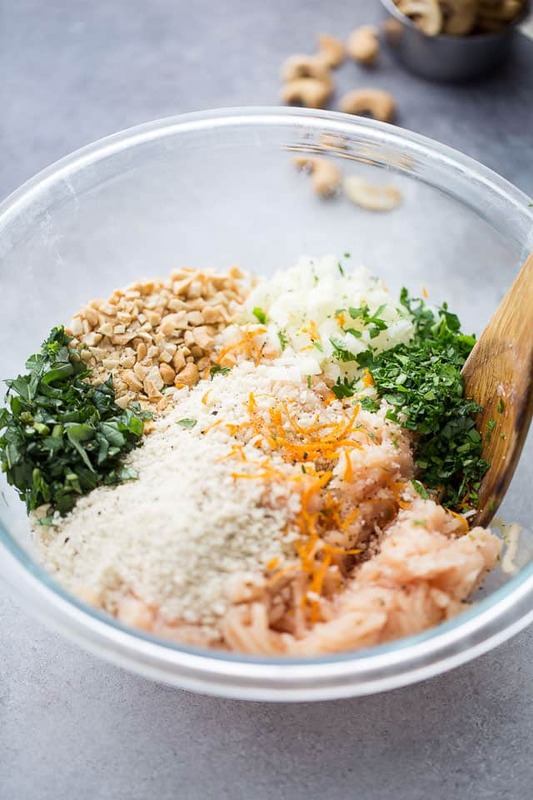 In a large mixing bowl combine ground chicken, panko crumbs, salt, pepper, onion, basil, parsley, cashews, orange, and cream cheese. Mix until everything is thoroughly combined. 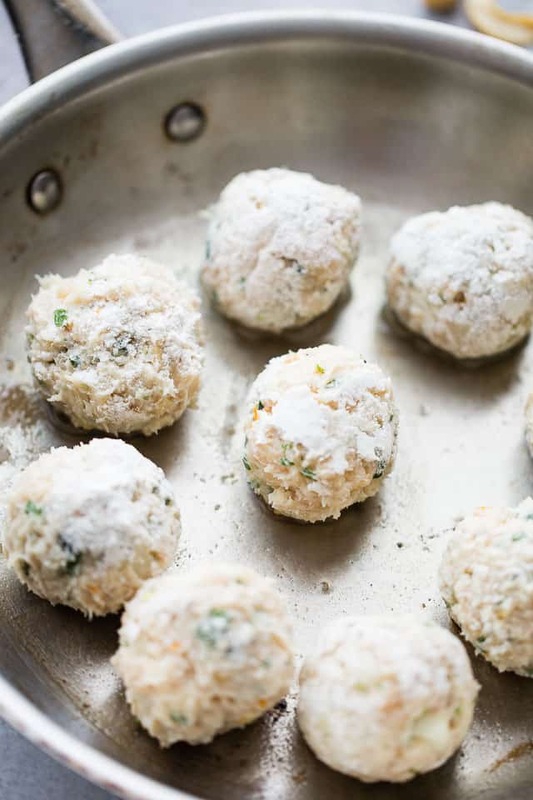 Roll meat into 1 inch meatballs, place in flour, turn to lightly coat on all sides, and add into hot oil. Cook and turn for 2 minutes, or just until a little browned on all sides. Transfer meatballs and hot oil to a 9 x 13 baking dish. Bake for 18 minutes, or until meatballs are cooked through. Prepare the sweet and sour sauce by combining all ingredients in a skillet. Bring to a boil; whisk frequently and continue to cook over medium-high heat for 4 minutes or until sauce is reduced by 1/2. Pour prepared sauce over meatballs. Serve as is for a delicious starter or appetizer, OR serve over rice for a full meal. This looks wonderful! I never thought about adding cream cheese to meatballs. I bet it tastes amazing! Cashew chicken is one of my favorite items to order from Chinese restaurants – I bet these meatballs are delicious! What a delicious meatball recipe! I need to try these! YUM! This just looks and sounds incredible! I can imagine these would be a big hit in my home! I know my family would love these meatballs. They sound delicious! I have a graduation party coming up and these would make a great appetizer for our spread! Thanks!! These look SO yummy! Headed over the check out the recipe! These sound soooo appetizing. Love! Oh, hopping over to the recipe… I may have licked my screen just now. 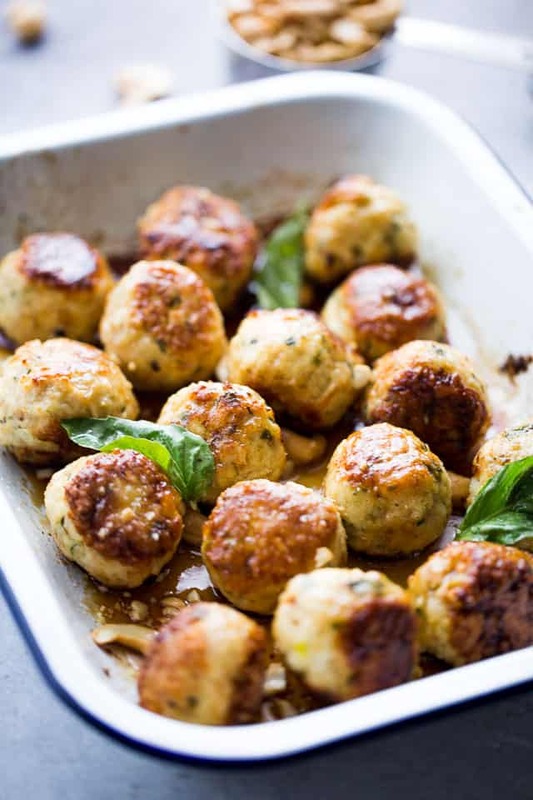 These looks super delicious, what a great meatball recipe! Oh, my! These look fantastic. I will pop over to Meagan’s blog to check out the recipe…but first, I must hunt down your popcorn…mmmmmm…. Cashew chicken? Such a fab idea! 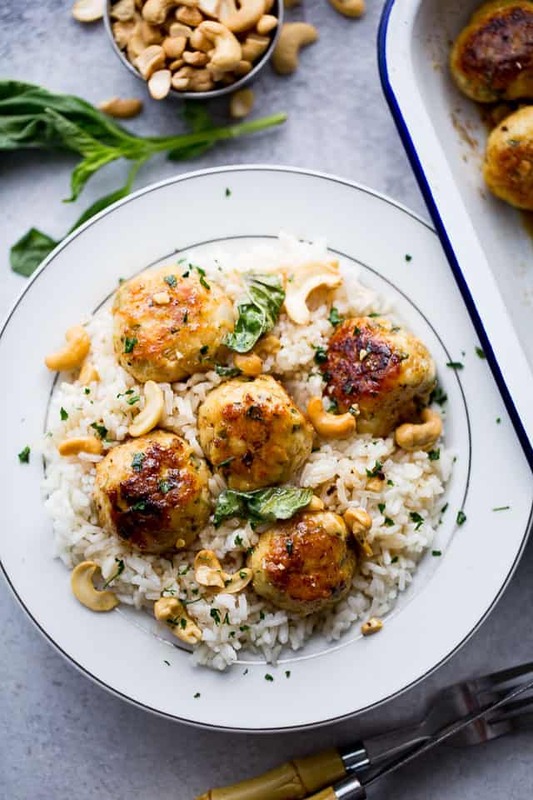 Incorporating the cashews into the meatballs is a great way of enjoying both the chicken and the cashews in one bite … I’ll have to check out your sweet and sour sauce as well. What delicious looking meatballs, and a wonderful guest post for Meagan! Thanks for sharing such a great recipe! These look really good and I bet very tasty with the cashews in them. Kate: As soon as I opened my email and read the title, I got all excited. 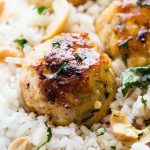 I love cashew nuts…And combined with chicken in a meatball is even better. Did you know that cashews (the fruit and its nut) is native from Brazil? The nut is attached to the fruit and use both in several dishes in Brazil. These look SO good, Kate! What an awesome recipe! Thanks so much for the guest post! Everyone including me are craving these for breakfast. Oh yea, definitely checking these out.